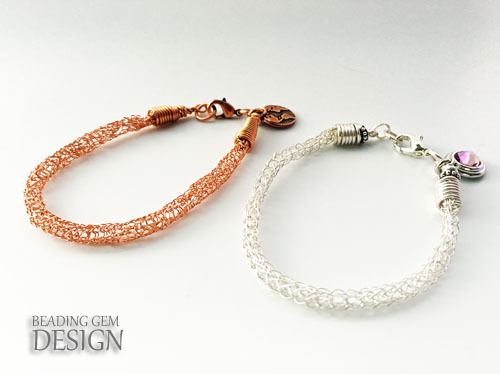 The inspiration for this post came from reader sis5of11, who left an intriguing comment on a past post about the ISK or wire crochet technique. She said, The reason I find ISK and Viking Knit to be different is because, while they LOOK similar, VK is, I think, sturdier after being drawn, while ISK, when drawn, is a softer, more flexible chain. I think VK is more suited to jewelry for men than ISK is." She made some valid points which I wanted to explore further. So this review compares the two tools and techniques in more detail - as much as I could. I don't use the traditional dowel technique any more for Viking Knit. It is too much of a pain what with making a clover, marking the towel and trying to position said clover properly. 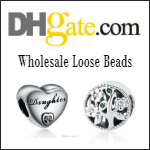 I like the Lazee Daizee tool which I reviewed before as it eliminates the awkward wire clover. 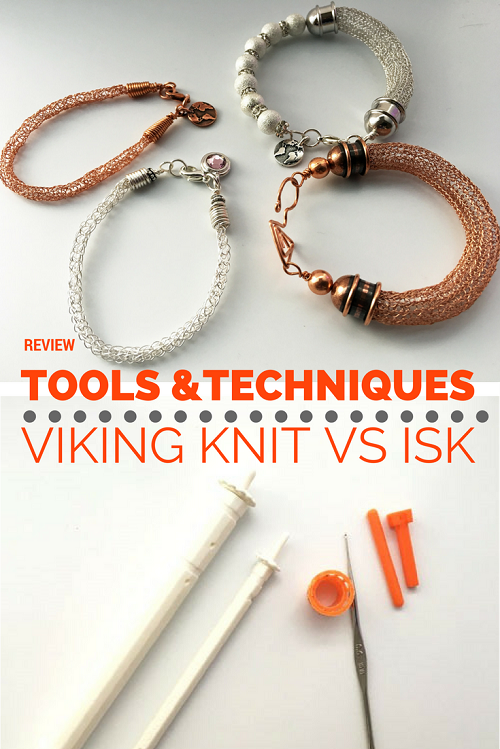 There are now actually two sizes of this useful Viking Knit tool. There is the Lazee Daizee Viking Knit 1/4-inch Tool which suits those who like dainty and the newer Lazee Daizee Large 1/2" Viking Knit Tool. I used the latter because I wanted to compare directly with the smallest round ISK loom as well as the extra small 4 loop tool both of which are part of the basic ISK loom set from Yoola Design. I used a 0.6 mm crochet hook although I suggest beginners use larger hook sizes and work down. 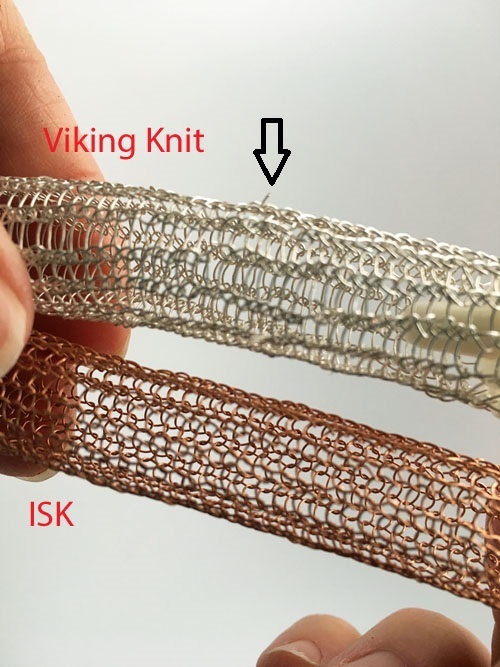 Drawing the wire tubes is the same for both Viking Knit and ISK. 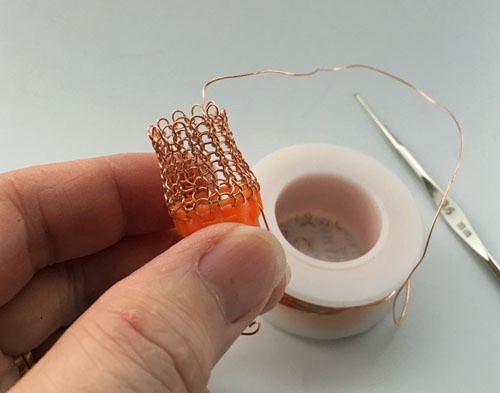 The idea is to make the wire stitches even during the repeated constriction process. I happen to use the draw plate from Yoola Design because it was the only one I have with big holes. 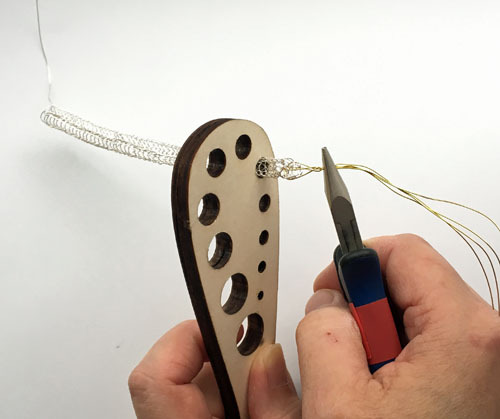 You do need a draw plate which have bigger holes if you also use the large Viking Knit tool or the round looms from Yoola Design. I used 28 G wire for all my test bracelets to be consistent. 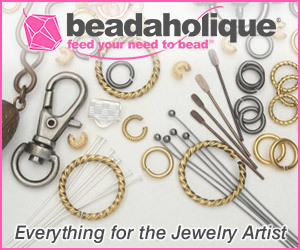 My favorite wire are those from Parawire and also Zebra wire from Fire Mountain Gems. The fine silver plated wire made by Parawire are the shiniest to use and that was what I used for the silver colored Viking Knit ones. 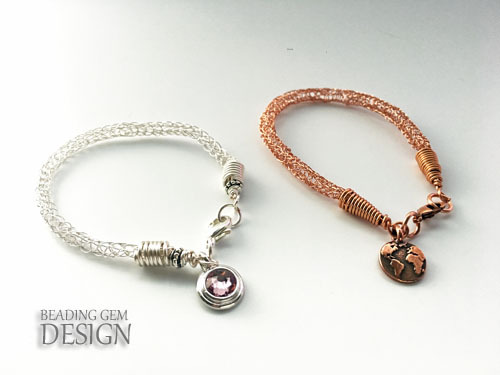 I used 28G copper Zebra wire from FMG for the ISK bracelets. 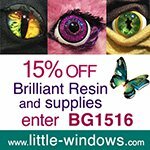 Very soft to use and more importantly, also coated so it will retain its shiny look! 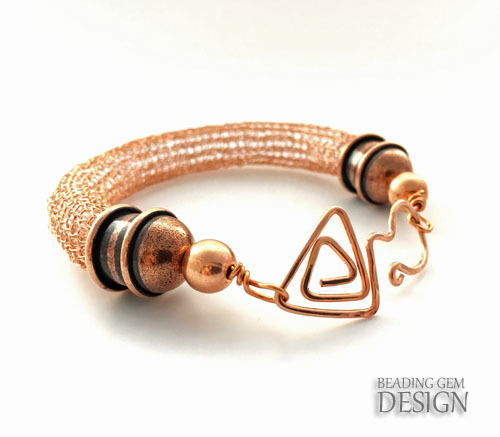 Reader, Divya, posted a comment about how she could never protect bare copper wire no matter what she did from tarnish. Well, that is true. 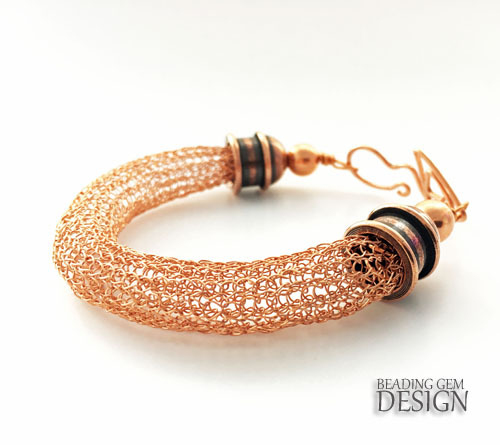 The only way to retain the shiny copper look is to use coated copper wire. Did you guess right which was which? Without a doubt, the ISK technique wins hands down. This is provided one is practiced in the technique. 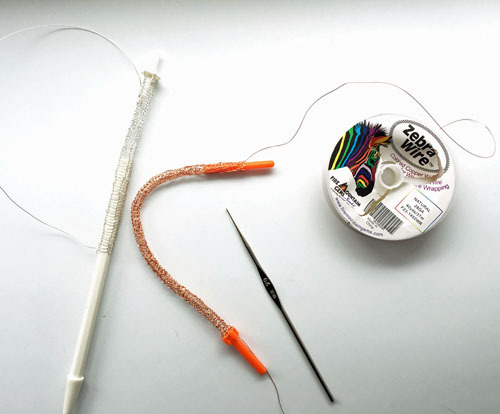 It is easy to understand why - the crochet hook only draws up a bit of wire for each loop before quickly moving on to the next. Whereas with Viking Knit, you have to feed the wire end around the loop above and then pull the working length through. Although I used 28 G for the examples in this review, I have tested out the two tools before with larger gauge wires. Shown below is the ISK technique with 26 G wire. It is possible but harder going than 28 G.. 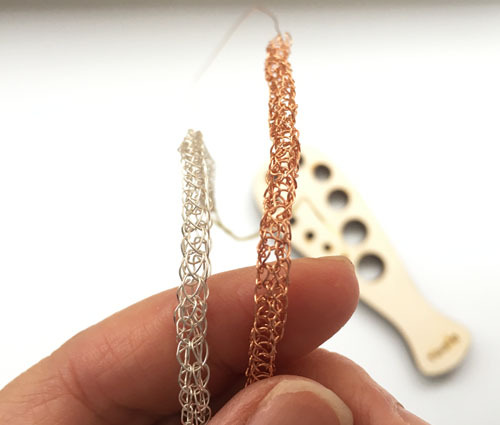 The Viking Knit method is more versatile for different wire gauges - you can easily work with 26 G, 24 G and perhaps 22 G. So I agree with sis5of11 in this respect that with thicker wire, this technique is suited for masculine jewelry. The ISK technique with the finer gauge makes for dainty and feminine jewelry. The ability to work directly from the spool when using the ISK technique is another huge advantage. With Viking Knit, you have to work with manageable lengths of 24 - 30 inches. So you have to be careful you don't get those wire ends poking out! You can see from the above photo that I am considerably neater when working with the round ISK loom compared to the large Viking Knit tool. But after drawing out the tubes to about the same size, the results are pretty close. It was more difficult for me to compare the smaller tools. The extra small ISK tool has only 4 loops so I deliberately used only 4 holes of the small Viking Knit tool. There was a bigger difference in the diameters of the tubes. I also had to draw out the Viking Knit bracelet more times than I could with the ISK tool to get to roughly the same size. The ISK bracelet would probably look more even had I drawn it out more times. Remember that the drawing out process also work hardens the wire. 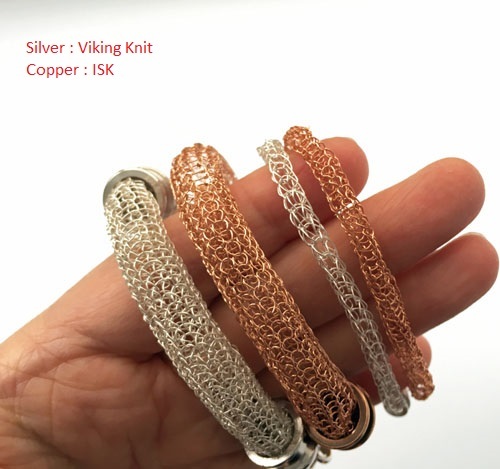 I found the thinner Viking knit (silver) more rigid than its ISK one because I drew it out more times than the latter. So it was not a fair test of softness for the smaller bracelets. But with the larger tubes, the ISK method produced less rigidity - i.e. softer. Both tubes were drawn out about the same number of times. 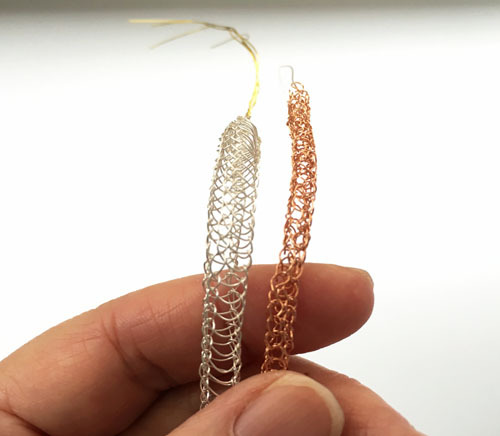 This lines up with the findings of reader H Rose Drummond who commented on the giveaway post earlier this week, "I have crocheted for many years and this is different but results are softer than Viking knit." 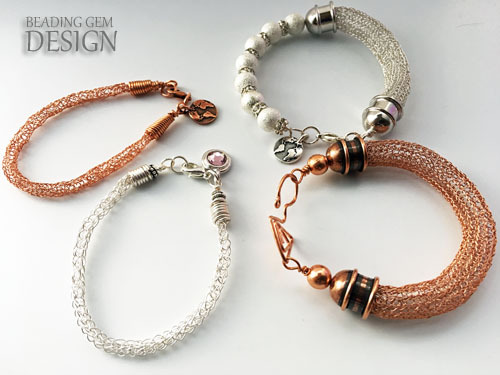 I happen to show the larger bracelets to a Viking Knit class I was teaching. Some were wondering if these bracelets would be easily "squashed". It is a possibility although they are more rigid than you think because of the work hardening. These are fine for occasions where they are not subjected to heavy use. 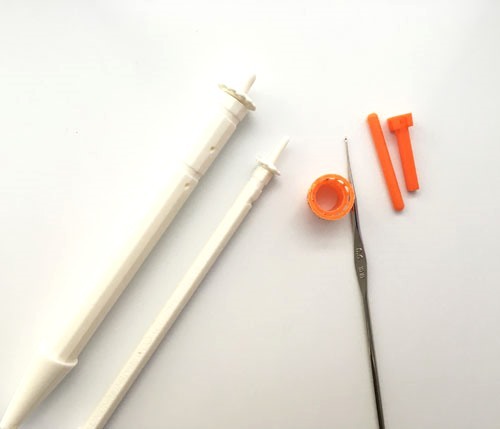 An option is to add beads inside the tubes before finishing up the ends. I finished the small ones with handmade wire ends and some excellent high quality charms I received previously for review from Tierracast. 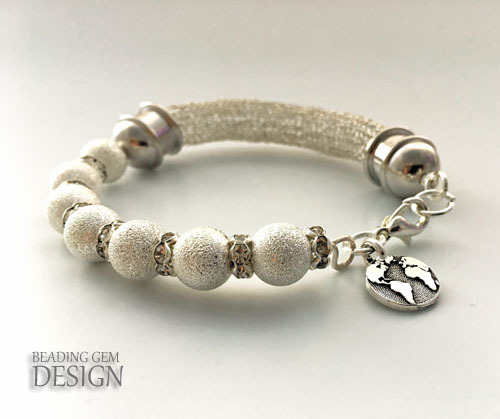 The earth charms and the silver stepped Swarvoski charms are my favorites! I also used their all new and gorgeous Capital end caps for the large bracelets. These have channels. You can add a layer of resin clay and add decorative flat back crystals if you like! 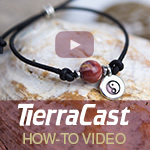 If you are willing to practice the ISK technique then, that will be the one which will give you fast results, soft and dainty jewelry. No wire pokies, either! 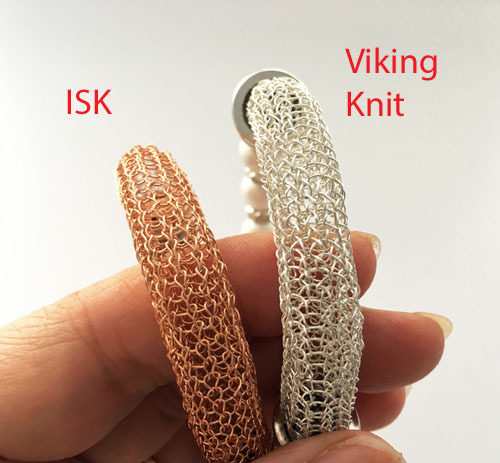 I only tested out the tubes for this review, but the ISK is much more versatile when exploring other shapes not just tubes as with Viking Knit! The Viking Knit method can be done without the special tools so that will save you if you do not wish to invest in them. The Viking Knit is also better for thicker wires. 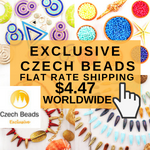 I do receive products for review as well as a small fee for any products purchased through affiliate links. 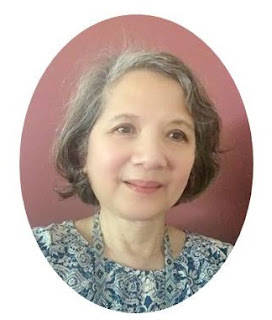 This goes towards the support of this blog and to provide resource information to readers. The opinions expressed are solely my own. They would be the same whether or not I receive any compensation. Thank you for the review and tips. I have to purchase the ISK took now to make a necklace with pearls. I am bored and I am looking at old posts on your blog. I don't know how I happened upon this one but I am glad I did. The ISK tool looks exactly like loom knitting on a very small scale. I am actually pretty good at loom knitting and I think I could pick this up easily. That is the deciding factor in choosing one of these techniques for me. Strange that you missed it before but I am glad you do check out older posts! 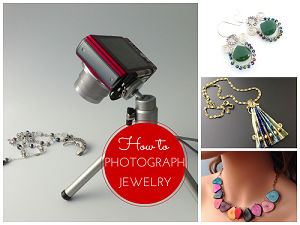 Working in smaller scale is why I love jewelry making!